which day(s) would you go? here are the build / assembly dates for my vlx from ellery at malibu, merced ca. 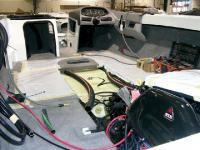 wed. 5/25, spray deck and hull, lamination applied as well as stringers and floor. thurs. 5/26, assemble deck and hull together, carpet the boat. fri. 5/27, rigging, mount enging, underwater gear, transom accessories. 5/28, 5/29, 5/30, memorial day weekend plant closed. 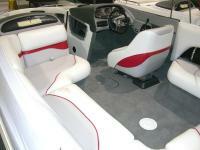 tues. 5/31, install all upholstery components and windshield. thurs. 6/2, detail boat in and out, add decals, prep boat for shipping. if you had 3-4 days to go and see your baot being built, which day(s) would you go? First off, Congratulations on the new boat. I've been to the factory 3 times. While you are there doing a plant tour you will see several boats in every stage you listed above. The coolest is seeing the boat "pop" from the mold, aka given birth. That is pretty cool. They normally pop early in the am, IIRC. Water Test is my second choice, but let them know you will deifinitley be there for it and try to line it up best you can. You might be able to catch a ride. Then, Rigging. But like I said earlier, you will see quite a few boats in many stages. Congrats! You will be very happy. I went during the rigging. It was good because I got to get up in the boat and see the ballast tanks, fuel tank, and stuff that will be covered up probably by the next day. They really move along quick. The first pic is what it looked like when I was there at the factory. The second pic was taken 2 days later. Personally I'd go for the lake test and get pics of the rest of the process. Go to Malibu Wednesday/Thursday/Friday AM, and then come out to McClure for the Holiday Week-End and play with us. Might help make the wait less painful. Frankly the factory is jammin. There's a good chance that your dates listed above will be moved one way other the other. I'd plan on going and if you hit the day of choice, better for you. But really, what Stewart said is true. You'll see other boats there in the different stages. Don't get disappointed if you miss your 1st choice. It's a blast. Plan on spending at least 3 hours. They'll take more time with you if you like. Even my second tour I was there for more than an hour. My spray date is on the 27 th. I am planning on taking the tout the following wed. Maybe I will see your boat in there for the lake test. How long do they spend in the water with each boat? It will be interesting to see the process. Good luck. Let's hope that there is still some work getting done around the holiday weekend. checked yesterday and the spray date is still the 25th. i will be at malibu merced on the 31st and the 1st. ellery at malibu is setting it up so my wife and i can get in the boat for the lake test on the 1st. maybe i will see you there 05 wake. I think my preferences would be much like stewarts. Hull out of mold, rigging and lake test.